The “Future of Work” is a topic that has gained significant traction globally by policymakers, workers’ representatives and the business community. Vibrant debates take place around imminent and inevitable changes and the related issues of how to identify and interpret trends; prepare and adapt to meet challenges; and how to harness emerging opportunities for sustainable organisational success. Trinidad and Tobago is not immune to the impact of these changes. This will have an impact on job creation as well as the management of our human capital via the Human Resource (HR) function. Is the traditional Human Resource (HR) function still relevant? Are HR practitioners adequately equipped to deal with the changing environment? Are our HR policies and practices in alignment with our changing realities? Is our HR function reactionary or proactive and how does this impact employee relations? The key lesson here for senior management and business owners is to reposition and rename the HR function from one of “support” to “business partner” and to include HR from the beginning in developing business goals and strategy. As new technology and trends emerge, the strategic role of HR will be increasingly important in achieving sustained organisational success. Development will invariably include some form of “people” disruption. HR is therefore required to not only anticipate emerging trends but to develop strategies for managing its effects on the organisation, particularly its human capital. These issues require that companies implement strategies and policies clearly articulating their position and the roles and responsibilities of parties to the employment relationship. Company policies are the strategic link between an overall vision and mission, and day-to-day operations. Clear policies and procedures define a company’s expectations and standards to employees and outline how these standards are maintained, communicated and measured. How Does T&T Stack Up? Now, with the millennial generation transforming the workplace, companies are looking towards greater work/life integration. Trinidad and Tobago, like many other Caribbean countries, is characteristically reactionary and resistant to change. Many other countries outside of the region have already institutionalised employee sensitive policies like telecommuting, flexitime, mandated time off, and employee health and wellness programmes. As a signatory to various conventions of the International Labour Organisation (ILO), there is already a strong foundation on which we can build if we are to adapt and survive. HR is at a crossroads. Technology can now accomplish many traditional administrative and technical responsibilities faster, cheaper, and better than before. With countless recruiting platforms, on-boarding programmes, human resource information systems and talent management systems available, HR as a whole will have to quickly adapt or face severe diminution of relevance in the market place. The size of the labour force in Trinidad and Tobago has been shrinking year-on-year since 2014. This can be attributed to either a rationalization of operations by employers based on prevailing economic challenges or individuals opting to engage in other activities as opposed to competing for a limited number of vacancies. The latter means that it is becoming critical for employers to find ways to keep existing employees. Organisations should not underestimate the value of periodic HR/IR audits and reviews of systems, policies and procedures. 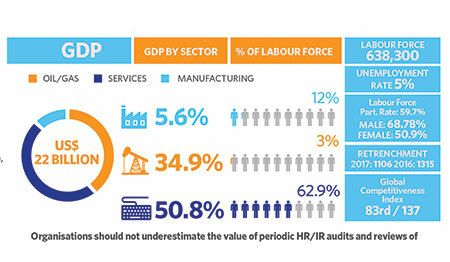 Although local labour laws have been relatively constant for a number of years, there are many other variables that impact the world of work and such audits will help to manage those risks associated with the human capital component of a business, ensure compliance and an optimal contribution of processes. Managing human capital risk is a vital aspect of continuous value creation and is especially necessary in recessionary times. It is therefore necessary to have a clear understanding of potential employee issues that are likely to arise from a poorly managed workforce and find ways to identify, develop and implement strategies to mitigate against such issues. The private sector is a key contributor to growth, poverty reduction and wealth creation of any country – it is the indispensable engine of job creation and economic growth. It requires not only an enabling environment but also an ability to respond to environmental and organisational changes. The future is already here. Current trends in business, society, technology, communications and information are changing the where, when, how, why, and with whom employees will work over the next few decades. For investors, this reality demands an appreciation for the human capital component of enterprise and its tangible and intangible importance to organisational success, share price and return on investment.